1. High quality standards: KEYKO ® replacement batteries meet and even exceed the strictest device's manufacturers specification needs, we take care from all Row material and components to the Final Product, tested automatically One by One. 2. Long lasting work life: KEYKO ® AGM TM high standard Absorbed Glass Material separators gives to our batteries between 3 to 5 years of working life. Each battery carry the best technology and performance. Featuring high discharge design, wide operating temperature range, and long expected service life. 4. Warranties: with KEYKO batteries you'll have 1 year warrantee from manufacturer. Lead Acid Batteries are typically used from Home Alarm Systems, Uninterruptible Power Supply(UPS), Lighting Equipment, General Electronics, Home Security Systems, Emergency and fire Systems, Medical Devices, Electric Scooters, but also for higher rates capacity devices like Solar Panel Systems, Bank of Batteries Back up for Servers, Motorcycles, Wheelchairs and many Other Applications. 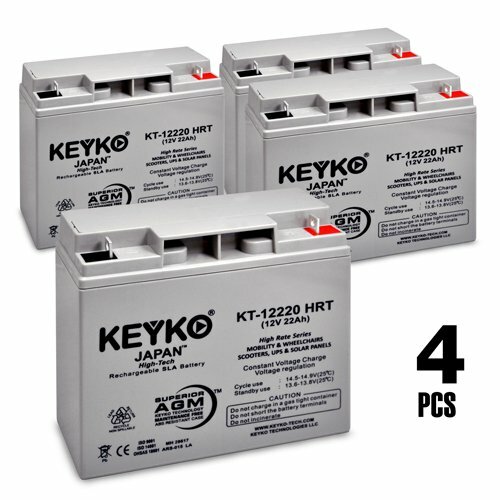 Genuine KEYKO ® JAPAN High Tech TM 12 Volt 22 Amp DEEP Cycle fresh Battery SKU High Rate Series KT-12220-HRT. Terminal Nut and Bolts L-1. KEYKO ® HRT TM 12 Volt 22 Amp High Rate Series Technology gives 3 to 5 years designed floating life. Thicker Plates and Constructions for Log Lasting Performance.